J has been obsessed with "The Gruffalo" by Julia Donaldson lately. 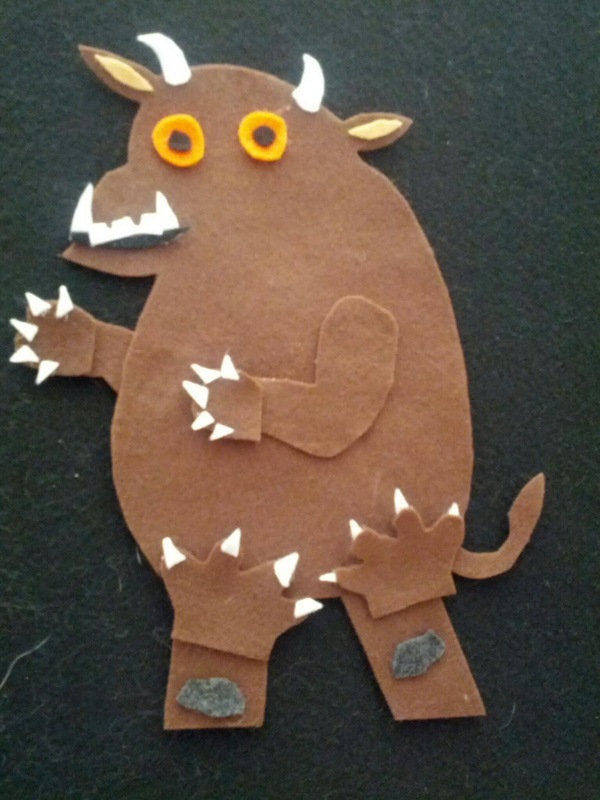 He is constantly shouting one of the following phrases, "Gruffalo pie! ", "Why snake, hello. ", "He has knobbly knees." or "Why didn't you know? There's no such thing as a Gruffalo." 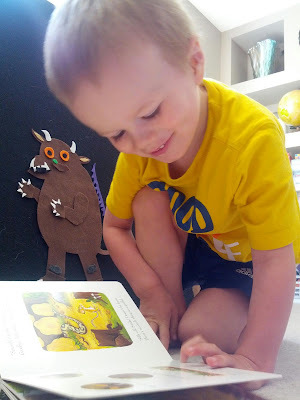 As part of his Gruffalo obsession, we have been reading the book, and its sequel "The Gruffalo's Child," a lot. And we have also been enjoying the movies a lot. However, I wanted to come up with some fun Gruffalo activities for him to build on his interest. I have been having a lot of fun putting together felt board activities, so I thought it would be great to do one for this book as well. Sure, I could have made each individual character and have him act out the story, which we have been doing anyway with stuffed animals, but I wanted something different. 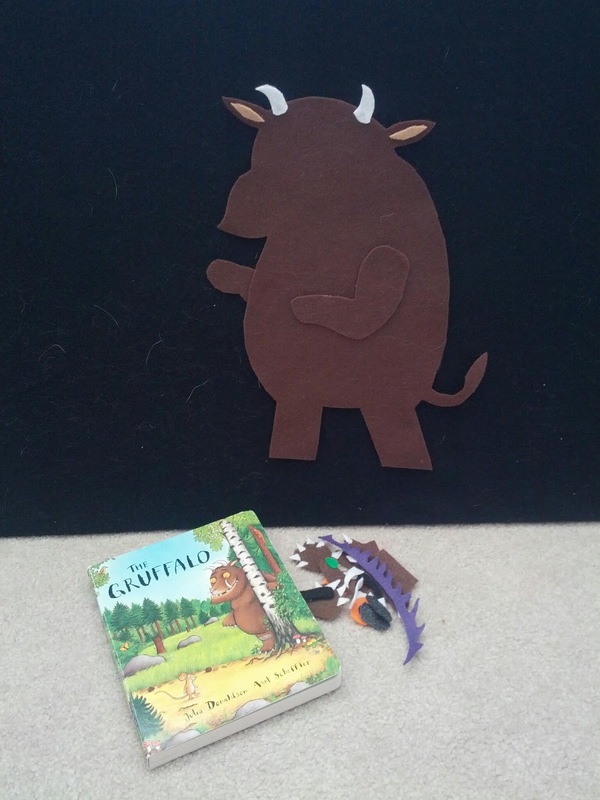 When I was reading the story again, I thought it would be a great idea to build the Gruffalo, feature by feature, as we read the story together. Here is what I came up with. 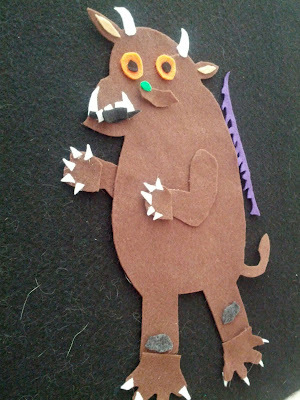 I started with a basic outline of the Gruffalo with arms and horns hot glued on. I then cut out all of the Gruffalo's features, hot gluing where needed. Then it was time to play! 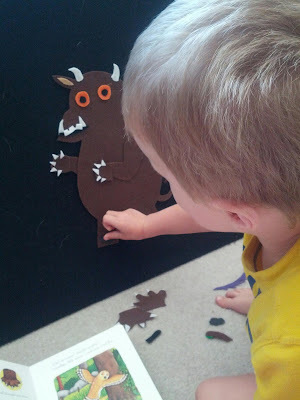 J set to work building the Gruffalo as I read the story to him. 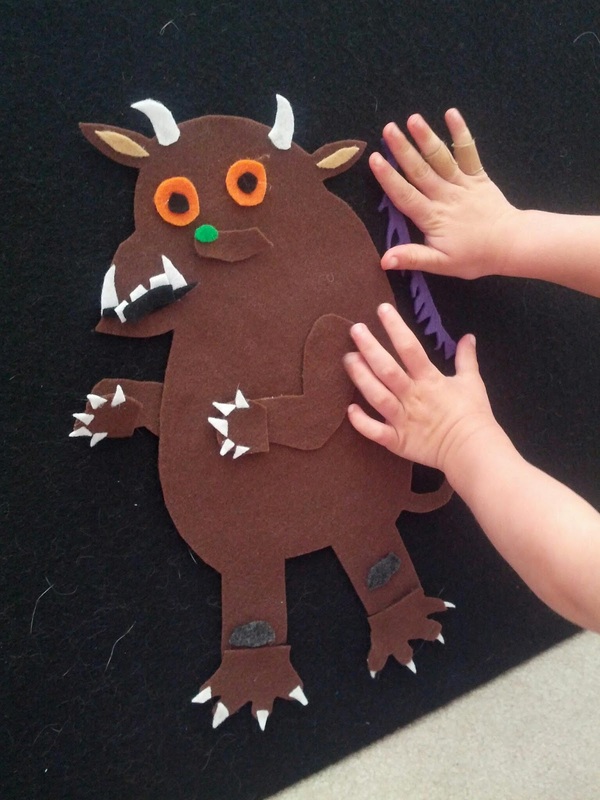 Adding the purple prickles to the Gruffalo's back, more or less. downside to owning a white cat and a black felt board. Then J took some time to read the story afterwards. I love the look of pure delight on his face. 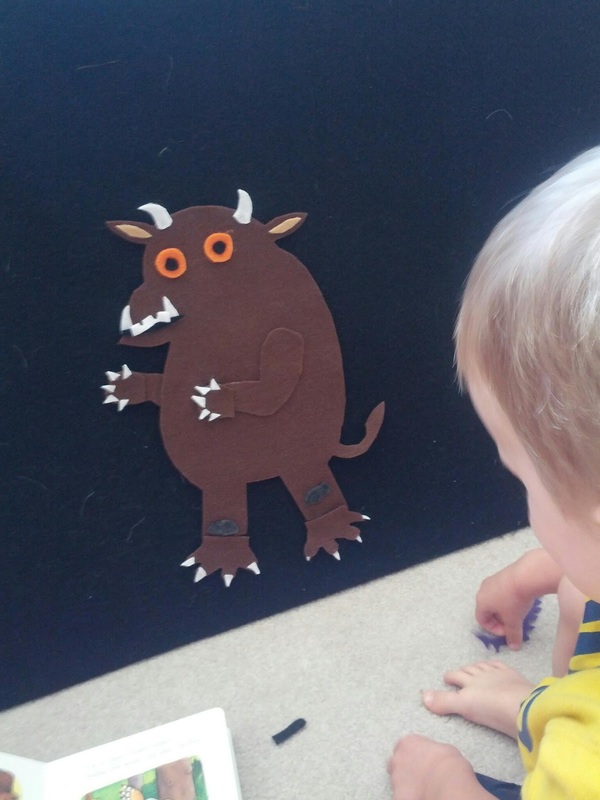 Looking for more felt board activities? 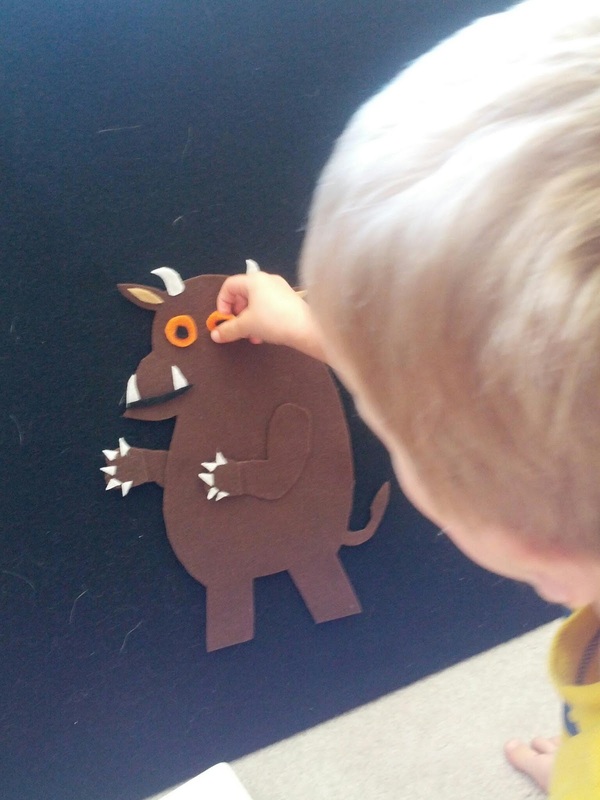 Be sure to check out some of our other felt board activities or browse our felt play board on Pinterest. 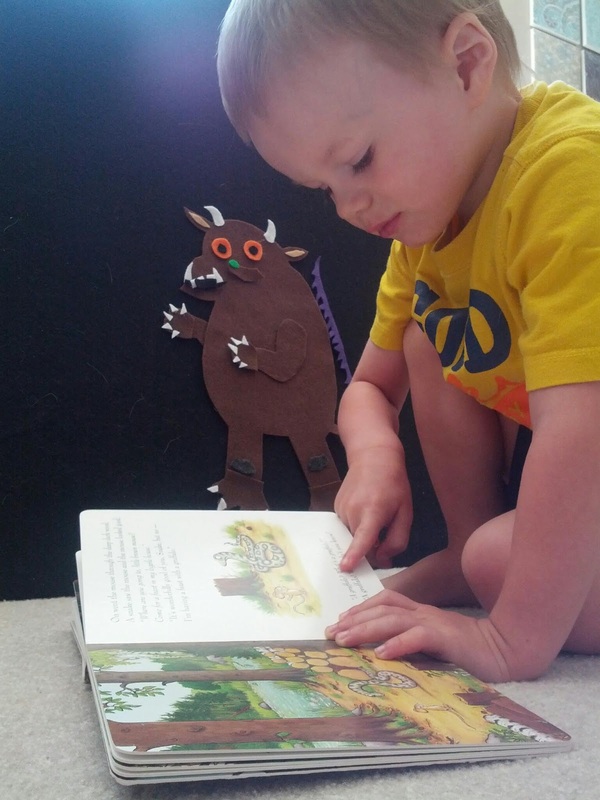 Want more Gruffalo? Check out my other Gruffalo activities or follow my Children's Book Activities board on Pinterest. I love this! I'm pinning it so I remember to try it with my girls! I love this idea! I am posting it to our Gruffalo pinterest board. We are starting a Gruffalo Adventures contest in a few weeks, so come follow us on facebook at NCircle Entertainment to participate! Aw, thank you! I will definitely check it out as my oldest is living and breathing the Gruffalo right now.